Background: The formation of senile plaques and neurofibrillary tangles of the tau protein are the main pathological mechanism of Alzheimer’s disease (AD). Current therapies for AD offer discrete benefits to the clinical symptoms and do not prevent the continuing degeneration of neuronal cells. Therefore, novel therapeutic strategies have long been investigated, where curcumin (Curcuma longa) has shown some properties that can prevent the deleterious processes involved in neurodegenerative diseases. Objective: The aim of the present work is to review studies that addressed the effects of curcumin in experimental models (in vivo and in vitro) for AD. 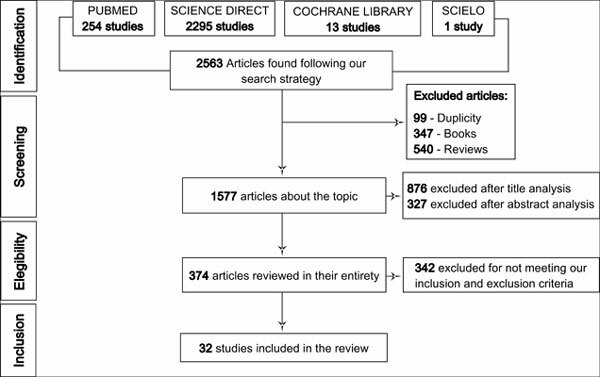 Method: This study is a systematic review conducted between January and June 2017, in which a consultation of scientific articles from indexed periodicals was carried out in Science Direct, United States National Library of Medicine (PubMed), Cochrane Library and Scielo databases, using the following descriptors: “Curcuma longa”, “Curcumin” and “Alzheimer’s disease”. Results: A total of 32 studies were analyzed, which indicated that curcumin supplementation reverses neurotoxic and behavioral damages in both in vivo and in vitro models of AD. Conclusion: The administration of curcumin in experimental models seems to be a promising approach in AD, even though it is suggested that additional studies must be conducted using distinct doses and through other routes of administration. Alzheimer's disease, curcumin, Aβ aggregation, oxidative stress, therapeutics, brain.